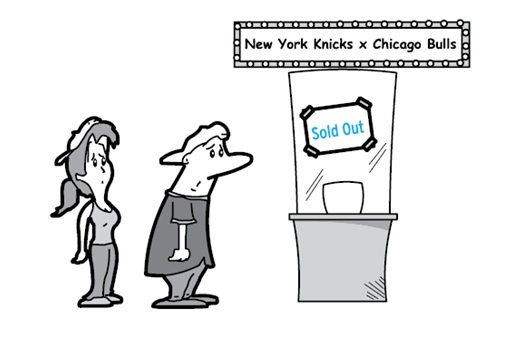 “Tickets for the playoff game between the New York Knicks and the Chicago Bulls tonight sold out in just three hours!”, Jay told Mick. “Os ingressos para a jogo decisivo entre o New York Knicks e o Chicago Bulls hoje à noite se esgotaram em apenas três horas!”, Jay disse a Mick. The clerk at the men’s shop told Henry they had sold out of pants in his size but that they would receive some more soon. O atendente da loja de roupas masculinas disse a Henry que tinham vendido todas as calças no tamanho dele, mas que iriam receber mais logo. Referência: “600 Phrasal Verbs” – Jonathan T. Hogan e José Roberto A. Igreja, Disal Editora. Clique aqui para conhecer este livro. Publicado em Phrasal verbs por admin. Marque Link Permanente.